I took a liberty with this Brave World quilt block by adding in a fourth colour. Most renditions I have seen of this easy quilt block show only three colours. I like to be different -- and I also love colour. So, I mentioned "easy". 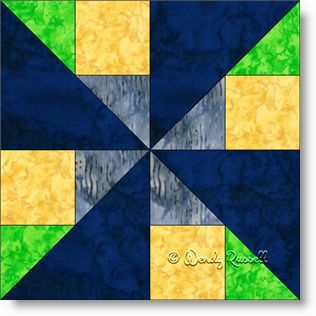 This four patch quilt block is comprised entirely of squares and the most common quilt patch -- the half square triangle -- in a couple of different sizes. This is a great starter block for beginner quilters and can be made as a large or a small block, to suit your needs. The sample quilts illustrated show two totally different looks. Note that in the "straight set" quilt layout, a third pinwheel appears because of the extra colour used.